RTI, ‘Reflectance Transformation Imaging’ or PTM, ‘Polynomial Textural mapping’ is a recent development in digital photography. This method of photography allows the viewer to interactively display objects under varying lighting conditions to reveal surface detail. This type of image is being increasingly used in the heritage field as a method of non-invasive recording of surface marks such as fragile stone and artefact surfaces, both large and small. Examples of where this technique has been successfully used include gravestones, wall inscriptions and graffiti. The process can be used on both ancient and modern surfaces. The process involves a fixed camera point, from which multiple images are taken with an off-camera flash. The aim is to take a series of images, each with the flash but forming an imaginary ‘dome’ of light angles. Imagine an umbrella, placed over the subject, each rib of the umbrella provides a guide to sight lines and a photo is taken at close intervals along each rib. The image stays the same except for the angle of light. When the series of images is complete, they are combined using RTI and PTM fitting software. In order to combine the images there needs to be a recognisable reference in each subject and, to enable the calibration, two reflective spheres, such as black snooker balls, are placed and shown in each shot. These reflect the points of light from the flash but, in each shot, in a slightly different position on the sphere. As part of an ongoing programme of research and development, Wessex Archaeology’s Heritage Team are continuing to develop capabilities in this field. This will allow us to provide clients with additional options for assessing and recording the difficult surfaces of our built heritage. During a recent test exercise Wessex Archaeology were lucky enough to partner with Salisbury Cathedral and its archaeologist Graham Keevil to collect datasets from in and around the Cathedral. These included a range of subjects including a faint wall painting, wall memorial plaques, stone marks on column bases and historic graffiti on external wall surfaces. 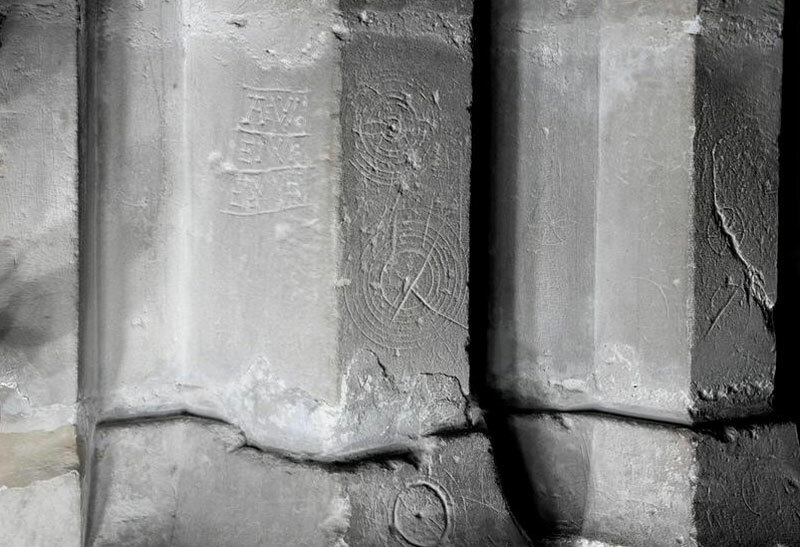 The preliminary results of these tests are promising and have revealed hidden inscriptions within the Cathedral which were previously unknown as well as clarifying the dialect and wording of an eroded and largely lost inscription. It is clear that this technique will be invaluable in informing proposed conservation work of difficult to read inscriptions, etc without physically compromising the surfaces of our fragile heritage. Do you want to learn how to apply Reflectance Transformation Imaging (RTI)? Using the documentation, collaboratively developed software (free), and physical RTI kit from Cultural Heritage Imaging , you will be guided on how to use RTI and associated technologies to capture physical real-world subjects so their surface relief features can be examined in minute detail not visible with the naked eye. This page lists the materials we offer with links to more in-depth information about each one. Using these materials, you can learn how to manage the processes step by step. Next articleHoard of over 400 Roman coins found in Reading.